Hi from Our New Lead Development Rep! Hello! I’m Whitney Ashe and I’m OpenSesame’s new Lead Development Rep. I’m excited to join the OpenSesame team and get the chance to work with some of you that I’ve met through BlueVolt. Before I came to OpenSesame, I was at Nordstrom for a brief stint. Before that, I was the Project Manager for BlueVolt’s creative team. During my transition to Nordstrom, I very quickly realized that I missed the elearning environment, as well as the culture that both BlueVolt and OpenSesame embrace. I really enjoy working as a team as opposed to as an individual performer, and I love being a part of a growing company. I’m excited to get to know everyone here at OpenSesame, and I hope to make everyone’s job a little easier by providing great leads. A little background about me—I grew up in Stevenson, Washington which is a very small, rural town about 45 minutes east of Portland. Feel free to ask me anything about how to prepare for a zombie apocalypse, as I’ve carefully honed my survival skills in the wilderness. I’d be happy to whittle you a fire if ever necessary. I went to college at the University of Arizona for 3 years, then transferred to the University of Portland to finish my degree in Psychology. During my last year in school, I interned at OHSU in behavioral health research, and then was hired on for a couple years after I graduated. I’ve lived in Portland now for about 6 years and love this city so much. 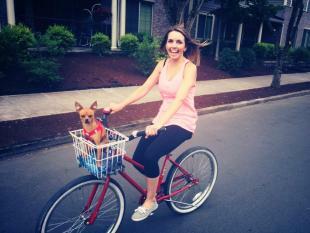 In my free time, you’ll either find me on my purple cruiser (Ms. Daisy), with my dog in tow; gardening, cooking, scouting free boxes in search of a new DIY project, or hiking on all the great trails offered in the Northwest. As the weather turns, I’d really like to host a cooking class once a month. Once I work out the details, I’d love to have any and all of you attend. It’s great to be at OpenSesame, and I look forward to getting to know everyone a little more.